Units from Dundalk Fire Station and gardaí attended the scene. 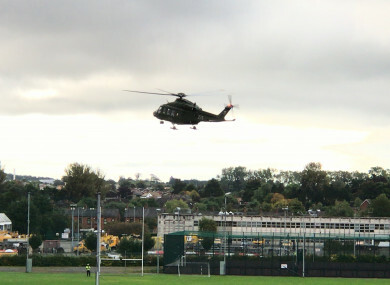 The air ambulance at Dundalk Gaels Football Club. GARDAÍ AND EMERGENCY services attended the scene of a serious road traffic collision in Dundalk. It is understood that a truck collided with two pedestrians on the Avenue Road in the town this morning. The two pedestrians were taken to hospital. Their condition at present is unknown. An air ambulance was also dispatched to the scene following the incident. Email “Air ambulance called in after truck collides with two pedestrians in Dundalk”. Feedback on “Air ambulance called in after truck collides with two pedestrians in Dundalk”.